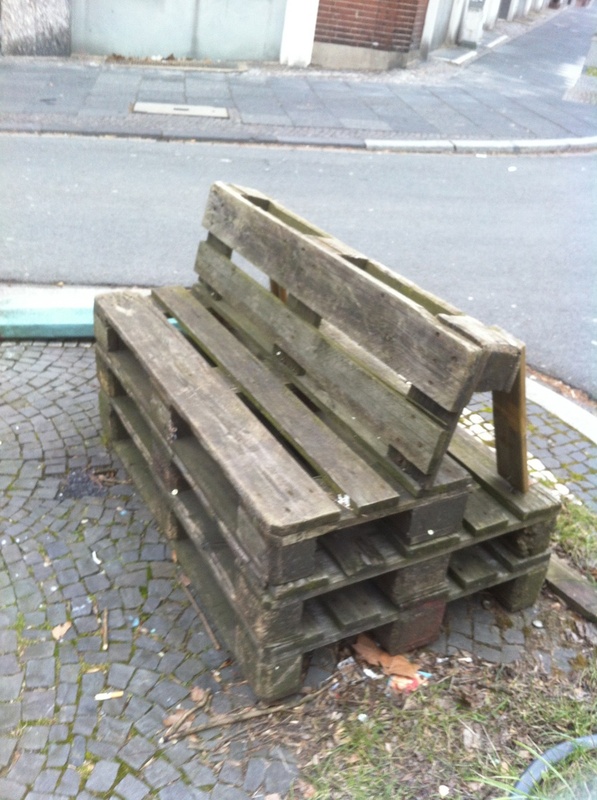 I moved back to Bochum again and take it as a good sign that just right after moving into my new home, i spotted some pallet benches right around there. They were not built in a way i would have built them, but nevertheless (or just because of this) I’d like to show those here, too, for they’re quite nnice and in a somehow very purist style. 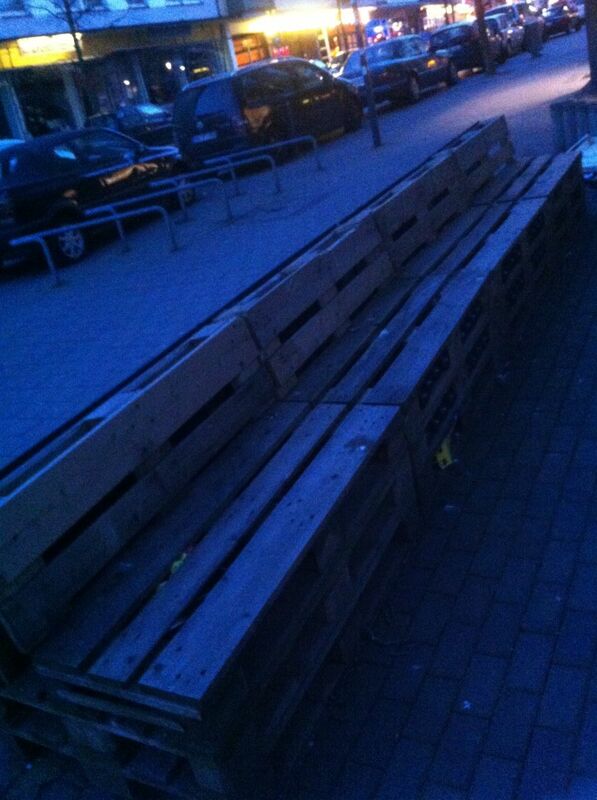 Pallet garden or street benches. This kind of bench shown here is ready to be seated in several versions in front of the “Freibeuter” (Bucaneer), one of the highly recommended Pubs in the Bermuda3eck, Bochums main party/pub quarter. 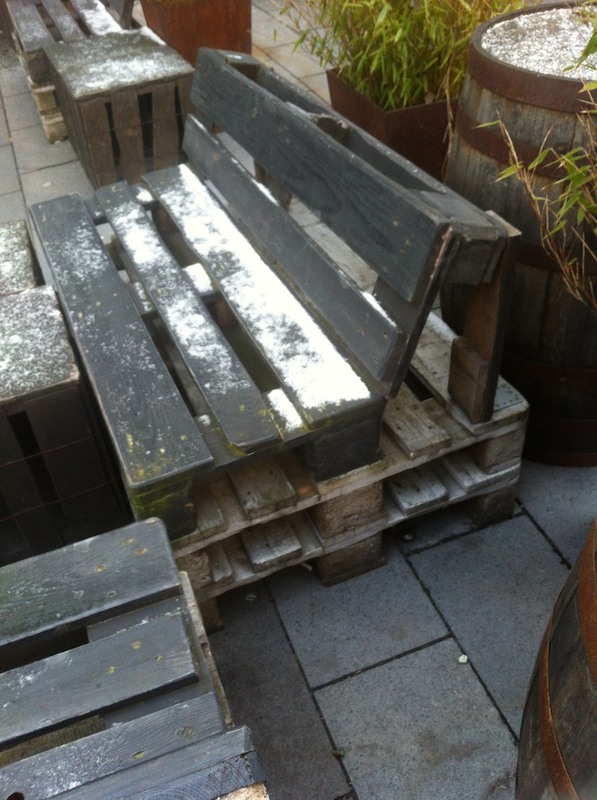 What comes to mind quite directly: the benches are throughoutly untreated and uncoated, what gives them the proper style for a garden bench, but also leads to the recommended usage of soil/dirt resistant clothing, when you want to take your seat without some cushioning. I think wind and weather would also sooner or later destroy color/paint/impregnation with time, but this would take its time and be slowed down even more with repainting etc. 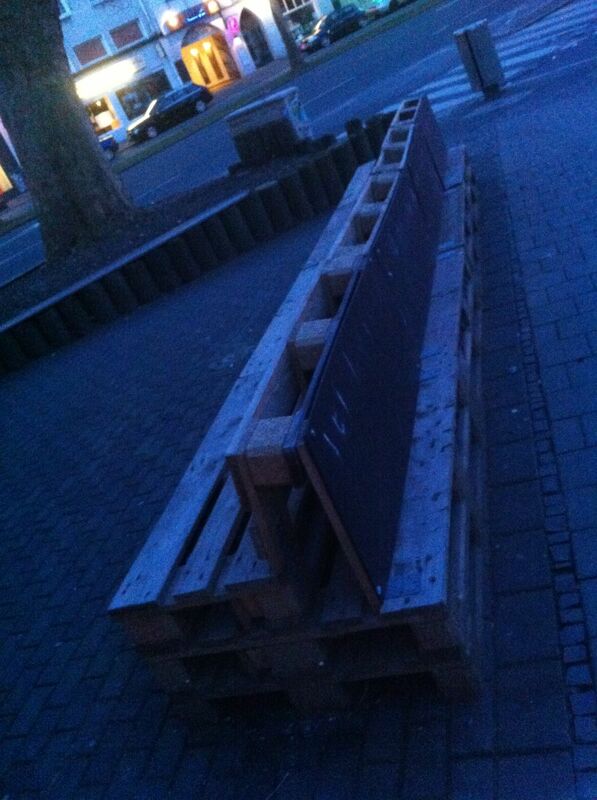 Next: “Full pallet version”. 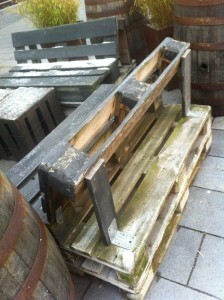 As a purist, I like the idea of using pallets and only pallets to build a pallet bench. 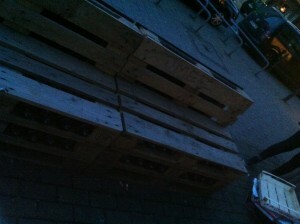 Euro pallets, to be precise, which are heavier than the disposable pallets which I prefer. Bolted/fixed as i do it, too: heavy, stable corner fittings. Backrest and seat built with one single, semi-knocked down pallet. Thats efficient use of material and good/stable practical implementation. Short addon: another pallet bench in identical design I found in the nearer distance. No idea who put it there. Advantages and disadvantages of this design are directly clear: Stuff gets heavy. So its recommended to assemble those on the future location, for transport will become difficult. 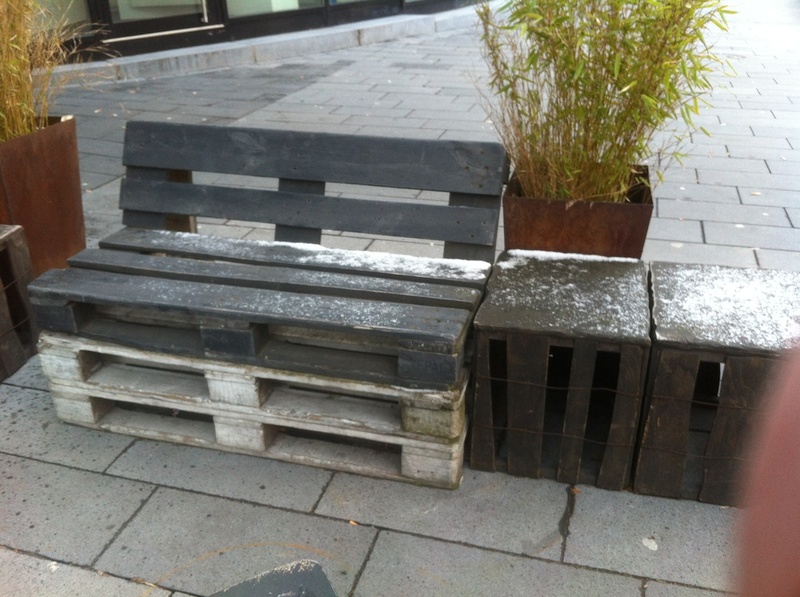 For a garden bench the concept is perfectly fine, the same goes for outdoor seating for pubs, the only difference here is, that you just can’t grow some plants around the bench after some years, when it started to decay (hopefully, in a picturesque way), what in my opinion would be the logical secondary use of a pallet garden bench would be: just place some plant pots and/or let overgrow it from below with some climbing plants. And now for something completely the same, only longer and, unfortunately, spotted after nightfall. Just a street further: the same construction method, but slightly longer and with integrated bottle decoration. Seems highly suitable for pub atmosphere to me. I think something similar can be achieved with other materials, empty bottles are an underestimated material, anyway: sometimes i see them mortared, an almost translucent glass element in a cemented wall. 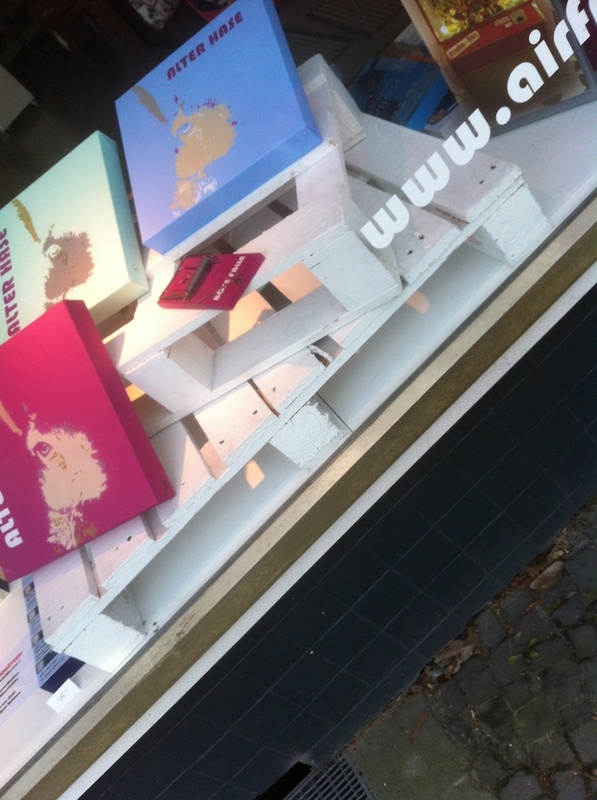 The disadvantage of this construcion method is obvious: thats not really transportable anymore. Personally, I do not like this massive, long design. 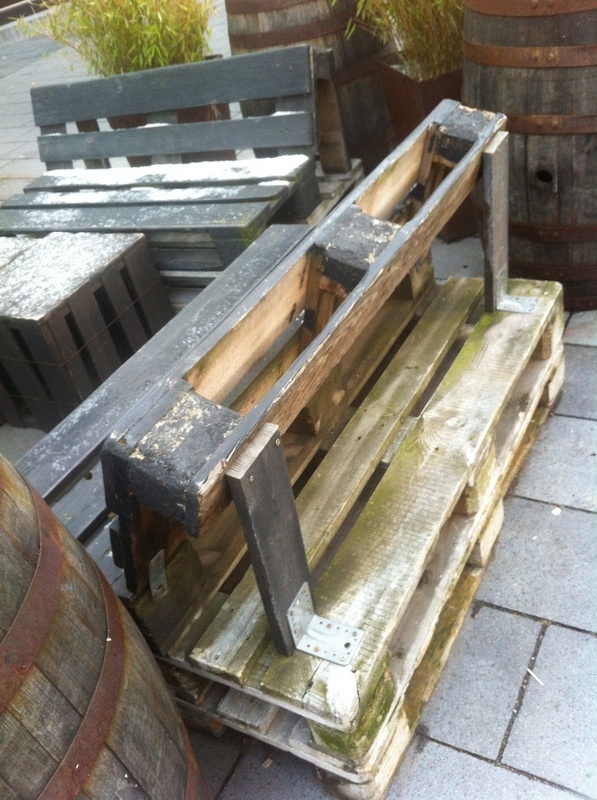 What i like on pallet furniture is the tension between the “rock solid” look and the “lightness” of the many gaps in the pallet structure. Here, everything is just very hard, massive, bulky and clunky. That fits the usage: this bench will last for some years, even if the drunkards fall over it every other evening. For this usecase, you are of course well served with this pallet bench style. For the sake of completeness: untreated pallets tend to decay outdoors. Here again, clearly visible. 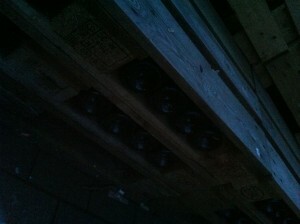 I guess, they will last some years though, nevertheless, i’d paint or varnish them. 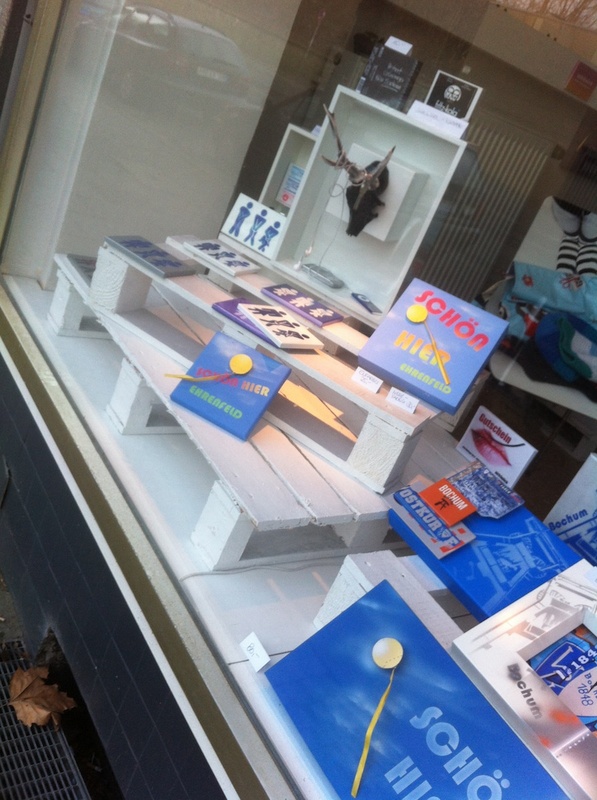 Quite different and almost a contrast: Shop window of the “airfreulich” in Ehrenfeld. Here you’ll find nice home accessories with local relevance, some of which are just issued on pallet elements. The whole look of the small pallets seems very “light” to me, I think this kind of pallets can be found somewhere – grocery stuff, maybe? Usage: decoration, or small furniture pieces, category bedside table seems to me obvious. Something different i was thinking about: using such small pallets or pallet elements to build some kind of alternative wall shelf: something I could imagine in the kitchen where you fix the pallet/pallet part flat against the wall and use the gaps to hang in bulky cutlery (ladles, spatulas, larger kitchen knives, whatever) and attach some hooks, too, for hanging pot holders, etc. to the sides/edges. But that’s just brainstorm, on the other hand: why not try it? It’s not much an effort and if the result doesn’t satisfy, its a small loss.